On May 19, 1943, Willie McRae turned 10, and his father asked him if he was ready to caddie at Pinehurst. Seventy-four years later, McRae is still willing to caddie. He’s just finally ready to slow down a little. McRae, one of the last two remaining men alive to have participated in the 1951 Ryder Cup on Pinehurst No. 2, officially retired from day-to-day caddying at Pinehurst this month. McRae still plans to take special requests, but they will be limited. He began a legendary career that led to enshrinement into three different Halls of Fame on that spring day with his father, earning $1.75 a loop. McRae’s career at Pinehurst parallels much of the great history of the game of golf. He has caddied for five presidents, celebrities from Mickey Mantle to Michael Jordan and many of golf’s greatest players, including Bobby Jones, Gene Sarazen and Sam Snead. Along with American player Jack Burke Jr., McRae is one of just two living participants of the 1951 Ryder Cup, and he remembers looping for Donald Ross on Ross’s crown jewel, No. 2. McRae has caddied in several of golf’s greatest championships, ranging from that Ryder Cup to multiple U.S. Opens and U.S Women’s Opens. A great player in his own time – McRae won the annual caddie tournament at Pinehurst three times – in the 1950s the U.S. Army stationed McRae at Fort Dix instead of shipping him overseas, installing him as the captain of the golf team. It is that sentiment that endures. It’s a legacy that continues, not only among the caddies at Pinehurst, but in McRae’s family as well. 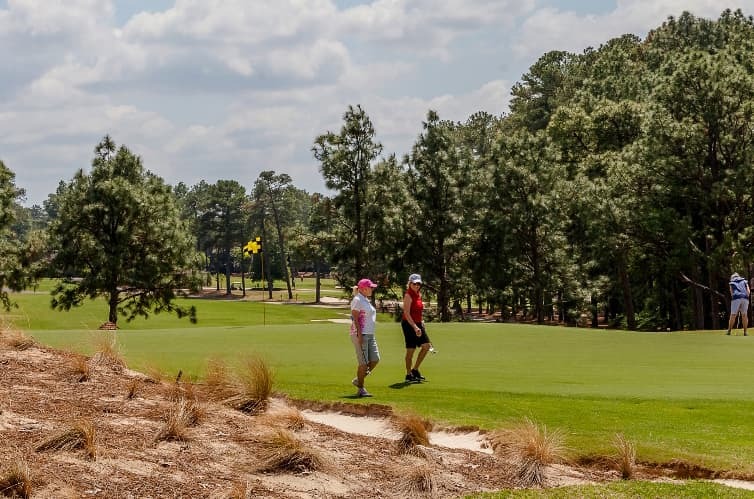 McRae’s son, Paul, has been one of leading instructors of the Pinehurst Golf Academy for more than 20 years, and his grandson, Darick, also caddies on No. 2. “Here are a couple things people must know about Willie,” says Jimmy Smith, Pinehurst’s longtime caddiemaster. “He treats everyone the same, no matter who they are, how much money they have, whatever. He just loves people. It’s a way of life that Willie passes on to his family, including Paul and Darick. They are the life lessons that both continue to hold dear and reflect upon nearly every day. Darick, who’s caddied at Pinehurst since 2001, recognizes that Willie’s career has meant more than just carrying a golf bag and reading greens. Willie McRae to the crowd at his retirement reception: "Be good to everyone." A reception at Pinehurst honoring Willie McRae was attended by family and longtime friends. Grandson Darick McRae has caddied at Pinehurst with his grandfather since 2001. A portrait of Willie McRae will hang in the caddie room at Pinehurst. Willie McRae smiles upon opening a gift from Caddiemaster, Inc.